I don't understand why websites are completely overhauling the design of perfectly functional existing layouts. IMO, there should be scheme OPTIONS. 100% agree. I'm fine with this layout. Except it already worked perfectly on mobile. And now on mobile, the top half of any and all pages are covered up by the build component headers. If I create a forum thread, I wouldnt even be able to see what Im writing or the first couple of comments. I can read this fine because the topic post is so long, but I can still only read the bottom of it. That's happening to me on the desktop for both firefox and ie. I REALLY DON'T like this new look. I agree. Most of us just wanted to be able to see long comment chains, not a complete site overhaul. Also, does the site feel a bit slower to anyone else? EDIT: It is still Precisely. It seems to be pretty snappy, I just really hate the graphical overhaul. Comment chains will no longer disappear when they become too long. The site should be significantly faster. Alright then. But when I went back to the 20,000 post thread, I couldn't get it to continue the comment chain. There should be a link that says "Continue this thread" and it takes you to the next set in the chain. It leads me to a page that says 'view more comments' or something like that, and then nothing happens when I click it. Well, whenever I click 'continue thread' or whatever, nothing happens. Like, at all. It just sits there. No loading icon, nothing. What browser and version are you using? We are having a hard time replicating that issue. Edit: just tried again and it seems to work now. Interesting, every part of the site loads faster than ever for me. putting the sidebar, which was on the right before, to the left is putting me off. I agree. WAAAAAAAAAAAAAAY overkill on the side bar. Completely agree. Horrid. The old site was perfect and I'm not liking this new layout at all. This is too darn bright as well. PLEASE change it back. or at least give us the option to go back to the original site. don't fix what isn't broken! You have taken an incredible drill down interface, and basically laid a ton of unnecessary ******** on it. Who needs all the graphics? The animations? My average time per visit it something like 30 seconds. Who are you making the site look so "facebook" for? Instead of more data, more power, more vendors, we get flashy empty useless graphics. It's not about hating something new, it's about having more tools and not more spit and polish. New interface has taken the site off track. I no longer have a sense of getting accurate data, now I feel like I am getting vague and cooked results. I want cold, hard data that saves me money. Now I feel like I am using google shopping or some other useless site. Forcing users to deal with radical changes that render the left part of your monitor white and useless while important informations are pushed to the right in a more imposant font into a thin column that constrain the users to scroll dows to oblivion even if he has a 1080p+ resolution, just to be 'beautiful' and blatantly killing the user friendly of a website, well played. I know it was harsh but believe me, I contained my rage. I cannot edit my saved parts list entries. I am a bit mixed about the new update. Cons: - It actually feels slower, not faster - Animations are overdone, like on the home page when slide onto the page. This adds to a feeling of slowness as you wait for the load AND the animations. - The bar showing you where you are/breadcrumbs is HUGE and causes needless scrolling. In general I think the whitespace is a little too much making less fit on my screen at once than before. - I still cannot figure out how to create a new Completed Build. I figured it out once (was not obvious in the old site and was always a struggle) and now I cannot find it anywhere on the new site. The old look/layout was much more functional. It was tighter and allowed quicker scanning of lists. Now there's much too much scrolling and TOO MUCH space--it can happen folks. The new layouts meant for mobile devices are ruining the functionality of websites with high information content. They are fine for landing pages and business sites, but please, not here. There is so much empty space on the left its cringe worthy. 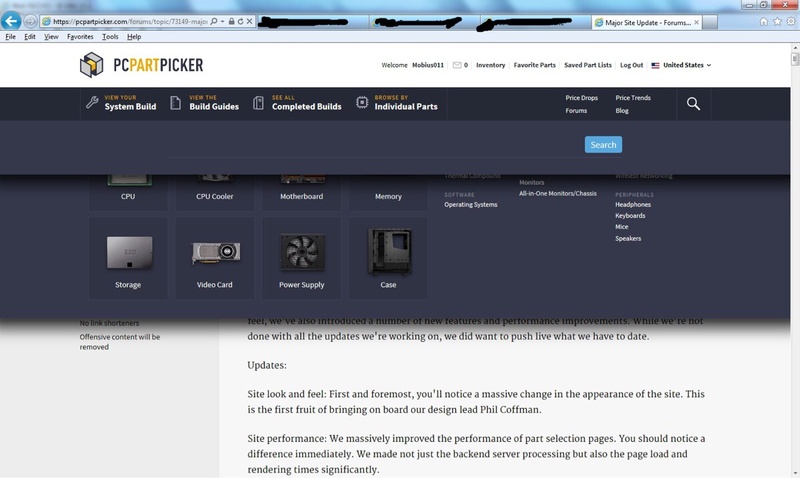 Pcpartpicker has always been such an easy website to use, and it never changed which made the layout so intuitive and easy to learn. Either give us options, or I'm sure there will be somebody out there to create an alternative. Wow, the site looks great and pages load much faster now! Thanks for this massive update. What happened to "show off your work" to turn saved parts lists into builds? Cannot find equivalent button. Found it: Click See all completed builds at the top and then Create A Completed Build button on the left. The process has changed a bit. Click the Completed Builds button at the top and there is now a dedicated blue Create A Completed Build button on the left. You can then select your current part list or one of your saved lists. If you click the list view tab you can view a thumbnail next to the parts. Awesome, thank you. By the way GREAT work on the interface. Not a fan of the new look. Then again, I'm an "If it ain't broke, don't fix it" kinda guy. I can't even figure out how to make my parts list into completed builds now. Click on the completed builds tab and there is a large blue create a completed build button. Okay, I see it now. However, if I'm on from my profile, and I go to completed builds from there, there isn't any button. As of right now, the only place I can find the button is if I go to "See All Completed Builds" Thanks for letting me know, though! Maybe add that same button to the "Saved Parts List" page and the "Completed Builds" page of individual profiles? The new web design does look better (prettier) for eyes, but the old design is probably better for people who are looking for specific information because it concentrated more words in one place. Especially if you compare the old parts and the new parts web designs. The old design had everything centered and it also had columns to separate the price and parts. It was better for eyes to adjust and absorb information in one glance. Yet the new design puts everything at the left side of the webpage and mixes the price, parts, and names altogether. It took me 10 second to look for what kind of the case a build uses, in comparison the old design would only take about 2 seconds. I would consider letting Phil Coffman go. The fruit is rotten. The site was simple. It was functional. Now it's a mess. You'd have to check the logs, but it seems like there are far fewer votes and comments on new builds. I would guess that the primary focus on the home page is static content, e.g. the Build Guides, and not the user builds which are "below the fold" so to speak. In addition, comments on build pages are equal or above the part list. This makes no sense. These builds are about two primary foci, The pictures of the final builds and the parts. With comments taking up the majority of the screen real estate, if it no longer easy to scan a completed build. So I, and it seems other, just don't bother anymore. I find it amazingly sad that this was the one thing that made me make an account here, just so I can comment on it and beg for either a roll back to the previous layout, or at the very least an OPTION for us to use the layout we want. I do not like this layout, it looks just like almost every layout I've seen on the Internet recently: shaped too much for mobile. I don't support mobile, I detest the fact it's as popular as it is now, and I hate even more the fact that sites like this, which were fully functional in the past and pleasing to the eye, are now turning to flat colours on every part, and extremely simple designs, which are nothing but an eyesore. PCPartPicker's design was perfect before this, we didn't need an 'upgrade', if anything, this was a complete downgrade, it broke what wasn't broken, it made the site ugly when it was aesthetically pleasing, and my question is WHY? Why was this needed? We browse this site to make PCs, not PHONES, and as such it shouldn't be 'optimised' for phones, especially with the fact that, from what I'm reading here, the site was fully functional on phones already! Please, don't pull a YouTube on us, PCPartPicker. Don't force a change that we don't want on us. If you respect your userbase, at the very least give us OPTIONS for these things! If you did, no one would complain about this and the highest rated comments wouldn't be ones criticising this new design! Very nice, I like the new look. It'll probably take everyone a while to get used to, haha. Two issues I've come across, when trying to access my private list I get "Permission denied. ", second, when trying to look through the CPUs I get a pop-up box saying "An error has occured." We are aware of the private list bug and working on a fix. The other error you are seeing should be patched up shortly. Neat. It's also allowing me to access it now, thanks. OMG guys! This is awesome! I was in the middle of some work, took a break from it to browse a forum and then I was like, "uh, how is this person able to change the thread style??" This looks great! EDIT: Also, which buttons are which for the left and right buttons? I think my work's firewall is preventing the buttons from displaying. Just curious. Glad you like the update! What do you mean by left and right buttons? I think he means the new upvote/downvote buttons. The upvote/downvote buttons. I wasn't sure what order they'd be in since from my POV on a work computer, they are both small boxes with x's in them. Side note: I found that I labored too much deleting old saved builds that I had and wanted to note that if there was a red button meant for deleting the build instead of having to go through the build's properties to then delete it, that would be convenient, as I like to keep a build for about a month or two at a time then delete it (and sometimes stack up to 12 builds, because I go on forums to help people get ideas for building rounded systems). EDIT: Also the speed of navigating between pages is by far better now on the work computer, but commenting/replying/editing takes a while for the action of pulling up a text box or clicking save to send the comment/reply/edit with noticeable lag. I might be the only one noticing these effects though. We are troubleshooting the X's right now. They should be up/down vote arrows. Thanks for the feedback on the saved builds. I'll see what we can do. The UK site doesnt work when i select UK is says an error has occurred, the us one does work. Fix should be up very shortly. Website is a bit broken. On the top right corner, it is just white. Also this new look is weird. Can you post a screenshot or explain your issue a bit more? Yep, this was a bug. We pushed a fix earlier today so should be working for you now. Thanks for bringing it to our attention! Love the spider in the source code! One thing, would it be possible to put in an option to remove an item from your existing parts list. The functionality used to be there but seems to be gone now. Its hand for determining how much is remaining on your list. Just know, I stole the spider as profile pic first x3! There is an X next to the buy button to remove a part from your current list. I cant see it. I think it only appears when you are putting one together rather than editing a saved list. The edit button on the saved parts list page is only for the description. Based on feedback from users I believe we will be changing that around. Click the title to go to your build and you can remove the part from there. Found it! All sorted now. Thanks for getting back so quickly! The memory page loads load faster, instead of loading the parts followed by the prices half a minute later, and I am sure the new look will be a grower, but having the filters on the left just feels really wrong somehow, kinda like finding the page close/minimise/expand buttons when switching from Windows to Mac OS. Ok - I figured out how to edit parts lists in firefox. you have to click on the title link first so you have the price history showing at the bottom. it's going to take me some time to get used to this, as i had almost no qualms about the previous look, i thought it was perfect. Stunning overhaul! Very nice professional look. Great functionality with ease of use. Why why do this? The site is so slow to load it is completely unusable. Try searching for a graphic card. I have a brand new quad core laptop running windows 8.1 and chrome. Back to shopbot. I figured out the problem. If you enter Canada as your country it stops dead. It loaded instantly for me on IE 11. Probably an issue with Chrome. Looks great! It'll take some getting used to, as it's rather different! One issue I've noticed. The Upvote/Downvote images aren't appearing (for comments and completed builds). This is in Chrome 40.0.2214.111 m.
We are aware of the issue and looking into a fix. The gunmetal blue area housing "CPU" "Cooler" etc pictos is overlapping the top of this page and every other - I think it's not scaling to the screen resolution. Cancel that: I changed res and it is still overlapping, cutting off the page tops. Can you let us know what browser version you are using? Hmm, I'm not able to reproduce on my firefox install. What version are you running? I apparently cant' update my Firefox beyond 12, so I am accessing the site via mobile site. 12? That is incredibly old is it not? Current version is 35 on windows. I might look into a fresh download and install. Really amazing interface! I have a touchscreen laptop and this new interface is PERFECT. Oh... shouldn't the interface be better for desktop users since it's a desktop build forum/website? Of course it should be good and 'equal' for everyone, but I don't have a touchscreen and I feel disadvantaged or maybe the new interface is not that good that you pretend. I mean in some aspects is great for touch. Build guide prices for individual parts has disappeared; even though total build cost is still shown. You have all of your retailers disabled. Please select them in your account preferences. Can you post the browser and version you are using? Do build guides have to go through a filter? I feel like that section will become cluttered and unhelpful if anyone can post there, and to avoid duplicates, I think that you guys should control what goes into that section. For example, say someone makes a build purely for one game (let's say Far Cry) for a budget (let's say $800). If anyone is free to post there, people who don't bother to look and see if something similar has already been posted may go and post their own FC4 $800 build guides, and then someone who wants a tower for $800 that can play FC4 will have no idea where to look. I really hope you guys are necessitating approval like you do with completed builds. Here's an idea. Along with monitoring them if you're not already, how about make sections (sections for different purposes, HTPCs, NASs, office machines, workstations, and gaming rigs), so someone can go to the section they want, use the price slider, and then find what they're looking for. We will have some custom sorting and they will be moderated in the same way completed builds are. The better guides will be voted to the top and the rest will be viewable further down. For the sections, the guides have tags users can use and that can be used as filters. Good to know that you guys thought it through. Also, people are giving you crap over the new UI, but I like it, and the faster response doesn't hurt at all, either. Keep on keeping on! Okay then, my previous complaint about the site being slower is now gone... for whatever reason. As for the build guides... I already see two 6000$ "Ultimate PC" guides and expect at least a dozen by tonight... Any chance there could be some pruning on those? Maybe something like "-10 rating for more than a week and it gets dropped"? We are working on sorting for build guides but generally speaking we want to leave it up to you all to decide which guides make the cut. I for one loved the new look once I came to the page today. Being able to reorder build pics is awesome, as I want them show up in the order of the build. Before, I had to load my images one at a time to get them in the order I wanted them. I have not delved more into the site yet, but I always thought the old look was kind of generic. However, usability I am sure was priority. It just looks more clean now and less clunky. Thank you so much. To all those that are complaining, the site is free to use. I am surprised that a site such as this that offers a tremendous tool for PC builders does not charge a membership fee. However, I would only be willing to pay maybe $20 a year. This new UI is absolutely BEAUTIFUL :D Nice job PCPartPicker team! How do I remove a saved parts list now? I can't find that option anywhere anymore. Right now, click edit description and then there is a button to remove part list at the bottom. We have received a lot of feedback about this placement and are exploring ways to make this more obvious. The new photo browser on build lists is great, but can you make the x a bit bigger so it's easier to close on a mobile browser? I'm on chrome for Android for reference. If you click/tap anywhere off the picture it will close the viewer. Ok, it seems to work, but not if you click the photo... It only works if there's a grey area around the image as clicking that grey area will close it,but not clicking the actual image. Loving the new website design. Well done on the larger picture viewer for completed builds!!! Nice looking update, but right now it looks quite unfinished. In the System Build, I can't deselect "Show Items with No Price Data". where is that check anyway? And I also liked the old PCPartPicker theme better... Could you please bring it back as an option for all of us? That option is no longer available. We now show all parts by default and that option is no longer needed as we have made very large gains in performance. We will not be bringing back the old layout but would love to hear any specific constructive criticism that you have. Ok, I do think the website is faster to operate and looks really modern compared to the old look. The look and feel of the website does make it look somewhat optimized for a Windows 8 Metro app (just saying lol). So good work on there. But I do have to point this out: showing items with no price data could be really confusing for most people. See, I make a lot of build guides myself, and when I pick my parts, I do want them to have some sort of price data, not just the item itself, because I can't base the item's price on some random other price it was back then; I do need the actual value of the item before it goes into my parts list. So it could really cause some problems to people not being able to properly calculate the total price of their system due to the price of the item missing, simply because the item has no price data anywhere, may it be Amazon, Micro Center, NCIX, Newegg, OutletPC, SuperBiiz, etc. Now we could manually add the price of that item, but then if it's from eBay or somewhere else, you have no clue if it's actually reliable because, who knows, the price could change anytime. Please get rid of the 'pages' when picking out a part, I like to scroll through all of the parts. This is really annoying because it takes forever to load each page. I don't think this new site is going to help with functionality. To look for a part I now have extra clicks because I have to click on browse parts then I have to wait for the page to load. On the other site it was at the top and was easy to get to. Then I have to click on filters which brings up a new interface. On the old site the filters where on the side and the extra click to bring up an interface was not there. Removing parts from your builds and an extra click as well because you have to hit the drop down arrow where as on the old site it was near the price. I like that PCPP is trying new ideas and innovating, but I would have liked them to run a beta or something instead of just throwing this at us. I also think that a way to change between the old and new style would be cool. The top of the website always looks like this to me. Thanks. We are aware of some issues with IE9 and working on a fix today. Sit tight! Sweet. You guys are the best; keep up the good work. So...this is annoying. http://i.imgur.com/38WQHfT.jpg?1 Using Internet Explorer 9 at work and don't have the option to switch browsers. Can't seem to get that thing to go away. Anyone else having this problem? Edit - I apologize. Reading through the comments, I see that you're already aware of this issue. ABS? NECHO? By God, we work for the same company. Gotta love our lovely workplace, with only IE9 available. how can i edit a parts list now no edit button ? Can you expand on this? There is still an edit button. banner on internet explorer is dropped down over the edit button. chome works alot better . know i see what the page looks like. looks great! love the new look! always rough going at first .end result great job! At the top, the pictures of the parts representing part categories are blocking a bunch of stuff. It will never go away wherever I go. Because of this, I can't read the first few lines of every post and it's really annoying. Works fine on mobile though. How do I get it to go away? We've heard reports of this from a few users and are working on fixing the bugs causing it. Which browser and OS are you running? It's on my school computer. I am using a different school computer now and it works. All the computers in my school run Windows 7 - I'm not sure what version though because they have blocked access to the properties section on the computer section. I'm pretty sure that the computer I was using is a OptiPlex 780 (http://www.dell.com/us/business/p/optiplex-780/pd - it's the smallest one). I was using Google Chrome. I am currently using internet explorer and it works just fine. Website looks great by the way. The load times are much better. I was largely disappointed in the site's new look for a couple of reasons. 1) I have 3 saved builds that used to all show in one page, which is much easier access for me, not I have to click on the build I want to look at and wait for it to load. 2) I keep very close track to the price changes of the parts in my builds by studying the graph to the right of each build, now there's no graphs so I can only keep track of the totaled price of all parts in each build and only at the instant that I check, I can't see how the price fluctuates anymore and I can't see what the prices were in the past. These two changes are extremely inconvenient for me, and I firmly request that the graphs be brought back and the builds be on a single page, rather than seperate pages. pcpartpicker looking all fresh like. Okay so question in the new update how do i remove (meaning delete) saved parts list!!!?????? For the life of me i cant figure it out. I want to clean up my list and for some reason i cant!! I had tryed that but no, not at all. They had it hidden in EDIT DISCRIPTION. But thankfully the fixed it so now its on the main page. One thing I noticed is that there are now a LOT of prices missing. I'm talking hundreds if not thousands. If you check for motherboards with an LGA775 socket, you get a list of 86 motherboards. Of those 86 only SEVEN of them have prices. If you look at AM2 and AM2+/AM2, they have 10 listed CPUs, but NONE of them have prices. There are 175 AM3 motherboards, but again only SEVEN PRICES!There are 92 AM3+ Motherboards, but 55 prices are missing! What happened to all the prices? These parts were previously hidden by default. We had a very large portion of users who would request we then add these parts because we hid products without pricing. This was a common issue when talking about older components like you mentioned (LGA 775) that are no longer commonly sold but people have in their computers. These users then look for advice upgrading their system and mistakenly thought the part wasn't on the site. Is there an option to hide them? Not at this time. Are they causing an issue? For people that are looking to upgrade older systems, it may pose an issue, but a list of parts is better than going in blind. I wouldn't say it's an issue, but it's annoying to have one item with price data and 50+ with none in the same filter list. Is there/will there be an option to move the filters back to the right side of the page? It's very annoying having so much blank space to the left when most other sites have the bulk of the stuff on the left. i cannot change the parts on a completed build, i went through a cpu, gpu and cooling overhaul on my current pc build but i cannot change the parts. also would be great if some how you could add a cooling section that covers custom water cooling parts, eg: radiators, pumps, blocks etc! Edit: also cannot choose already purchased with items from sellers, must make your own listing and not give props to the company you bought it from. Opposed to what the highest level comments say, I think the site layout is beautiful. I registered just to leave this comment, but it seriously looks fantastic. Using the filter is so much faster now, it's great. The only downside I see about the new look is on the forums. The posts aren't centered along the page, and there is a lot of whitespace on the left side of the screen. It just doesn't look right. Otherwise, fantastic job to the designers. I've never commented, and I never intended to, but can you at least offer me the ability to revert to the old layout? This is literally a pain on my eyes, and a bit of a nuisance on top of that. More than just my lack of willingness to change, I prefered the old layout much more. It was clean and to the point. That's why I liked it. It wasnt the mess Newegg offered, but now neither is particularly appealing. Please consider offering layout options. wow this nice. There is are going to be people like myself that dislike change, however when i put my personal preference and bias to the side this is an amazing thing that happened to this site. For new comers this is a more welcoming look and "old" timers this might take time to get use to but i love that this site is taking a step forward. Congrats! I like the new format. There are certain manufacturers from which I'll only buy. Now I don't have to wade through those which I won't consider. Nice job! Thank you for the speed increase. It would literally take around 30sec for the memory page to fully come up. However, the site laying is different, but I'm getting used to it. My biggest con with the site update is the graphics card section, it lists all the older graphics cards which nearly none of us select. Could you make the newest NVidia and amd graphics cards first then list the older ones. I usually make several builds under "saved part list" to compare prices and see price histories in one convenient location. Having all this information on one page made it very easy to buy at the right time, ie, when prices were lowest as compared to historical prices. The new saved part list does not show prices unless you actually select the build. Furthermore, I now have to actually go into the edit build on each saved part to see a chart of the price history. This is very inconvenient and the new layout has made it more difficult to quickly compare prices of builds with slightly different components - I hope you reimplement these features in the future. Also, while we're on the subject, implementing a price alert for saved parts lists would be great - in other words, it would be fantastic if I could make a build using saved part lists and you would send me an email when the price of that build hits a certain price. Thanks for the feedback. This is the type of constructive criticism we love to see. We don't know every single user's use case and this may be something we overlooked. I will bring up your concerns with the team and see what we can do. I believe we have some plans for a full part list price alert but there are some quirks to be ironed out. The site looks great! Props to Phil! I both love and hate this new look, on the plus side the site seems to run faster than before? Unexpected and welcome bonus: I use a seriously old and underpowered PPC Mac for general browsing: TenFourFox, no Flash player, NoScript and ABP just to be safe (even if it does get mangled, it's a throwaway). This site worked just fine albeit slowly, except when I used the German Euro prices part of the site, which would slow to a crawl and give slow script messages. Since the update, Partpicker Germany runs just fine. I'm surprised by all the whining. I like what you've done here and look forward to the other improvements that are in the pipeline. Looks good on this PC screen. My saved parts lists pre-update will not load. any help? Can you be more specific? What exactly is happening? I am logged in. Click Saved Parts lists tab. Click any of my save dlists, on the screen to the right it says an error has occurred and remains blank. I assume where the new format of parts list is supposed to load. It is strange because my names for each build has been saved obviously. I notice that the Case Dimensions has been removed. That was one of my favorite features on this site and even though it didn't have the dimensions of a number of cases, it was still very useful to me. May I ask why the feature was removed? This post is almost 1.5 years old. I never had any issues with the old version but the new skin looks absolutely beautiful and is wonderfully laid out! https://pcpartpicker.com/forums/topic/17543-water-cooling-parts - im just reviving a possibly dead topic. I like to make builds for fun and learning, and I'm sure ALOT of people would appreciate this. And if it cant be done... oh well... at least it was mentioned at least once more. For the moment, we don't have an interface to let you create Build Guides (or Completed Builds) from the mobile version of the site. Generally we are looking to get the mobile site functionality to reasonable parity with the full/desktop site. Guide and Build creation are pretty low on the TODO list, but the functionality gap is getting smaller, so we'll hopefully get there. Features like creating a Completed Build generally take a lot of interaction (typing in the write-up, formatting text, uploading images, etc). That can be unpleasant on a 4.5" mobile screen where the pop-up touch keyboard takes over 25-50% of your screen. And heaven help us all -- the auto-correct. But since people might want to edit or tweak on their Builds/Guides via mobile (especially for adding images), I'm still working towards make that an option. Hmm, I'm not seeing that completed build issue. What browser and version are you using? I am getting the same in both Chrome and Safari on Mac OS 10.10.2. Both are the current latest version. I assume you are being sarcastic but you aren't seeing anything near a 30s delay are you? If cannot be polite and civil please do not comment on our site.